Showcase your state's bird and flower in vibrant style with this majestic work of art. 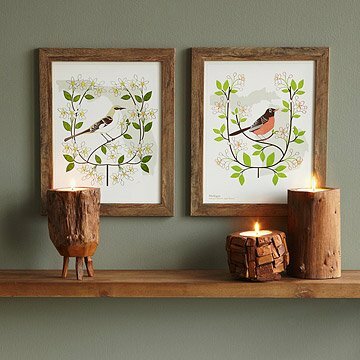 Show your state pride and celebrate the flora and fauna of home with this beautiful framed artwork by Anna Branning and Mara Murphy. Highlighted by the nostalgic look of vintage botanical prints, bold representations of your state's bird and flower perch and blossom in vibrant detail. Printed and framed in a barnwood finish or black BonanzaWood® frame in Portland, Oregon. Click here to view a PDF of all 50 states. Click here to see the Birds and Blooms Art - U.S. Map. Click to see Birds and Blooms Pillows - Individual States. Two friends, two antique printing presses, a bunch of ink and a whole lot of paper. This simple combination led Mara Murphy and Anna Branning, friends and co-workers for many years, to establish Dutch Door Press, a design & letterpress studio. They set up shop in 2006 in a beautiful Victorian house in San Francisco and named their press after the entryway to their studio—none other than a Dutch Door. With an affinity for rich color, vintage patterns, natural forms and symmetry, they create unique and boldly colored designs for greeting cards, posters, and invitations. All of their designs are printed by hand on their antique Chandler & Price platen press or an equally lovely Vandercook simple precision 15 proofing press. Comes ready to hang in wooden frame with Plexiglass. Copyright (c) 2014 - Birds and Blooms Art - Individual States artwork owned by Anna Branning and Mara Murphy and licensed to Uncommon Goods LLC. All rights reserved. Sweet and unique for the scientist who has everything! I won't be using this but I imagine it will be hung with care on a wall in my dad's house. It will bring indoors that which they love outdoors: they are constantly planting native plants and encouraging birds to visit their farm. I would say use your own picture hanging bits as the tiny nail and hook that come with it are not what I would use to hang a frame with glass. We have a "Texas" themed nursery and this print fit very well - not over the top and fitting the theme. The quality of the framing is great and the size is not overly large. Hung them on opposite sides of our large living room mirror. I ordered one for my sister's new home in her state flower/bird, and also one for myself! I ordered the black frames. The Wisconsin print is high quality, the design with the faint gray state silouhette behind the colorful bird and flowers has depth and interest, but works well in my transitional home. It is framed well, with a sealed and papered back, a metal claw hanger and felt pads (just like a professional framer would do). It looks terrific in my foyer. My sister loves hers! Beautiful addition to our home and a nice way of preserving some family history. I gave this product as a present to my grandparents. They currently split their time from their home state in the summer months, and the rest of the year in Florida. They both love their home state immensely, but they are unable to live there all of the time. For Christmas, I wanted to give them something that reminded them of home. This Birds and Blooms Art, representing their home state was perfect. My grandmother is quoted as saying "I wish I could have two - one for each state we live in." I collect Pennsylvania items and I thought this would make a good addition to my collection, especially because I'm a bird and flower lover. It arrived ready to hang up on the wall. My only quibble is that upon closer inspection, there are little pieces of dust/fibers(?) under the glass but I can't get to them because the back of the picture is sealed. But it's not too visible unless you look closely. This print is beautifully framed, the colors are vibrant. Collecting one for each state I have lived in to hang in my office. WA, CA, and AZ. Since the barnwood frame was more gray than my trim, I had planned on spray painting the frames but they were sealed pretty good on the back so I couldn't remove the frames. I imagine that the original artwork had terrific texture, you should know that these are just paper copies though. Other reviews are correct that the barnwood frames are perhaps not even really wood but a laminated wood look. Purchased the Minnesota print for my wife. I was a little leary about using this as a Valentine's Day gift but she loved it! We have it dsiplayed right above her desk in the home office. Really good reminder of where she came from. Perfect!